He is living with both parents and siblings. He is a master in his family and has a sister. His father is a merchant who earns a little income by selling woods and his mother is a housewife. This makes it very difficult for the family to cover their daily living expenses and at the same time addressing their children basic and educational material needs. He was healthy upon admission. Astawus joined Wallana KG in this academic year by his father as there is little access to free, quality, preschool education with close proximity to where the child is residing. 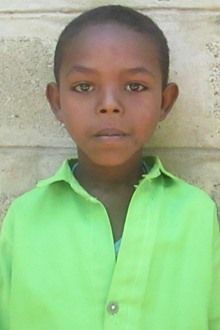 The child is enrolled in the Holt sponsorship program as his family is not capable of addressing his educational needs. Tell your friends Astawus needs a sponsor!